Location: Mostly in Preah Vihear and Kampong Thom provinces with a few in Stung Treng and Kratie provinces. Kuy are also living in Thailand and Laos. Language: Kuy is an unwritten, Mon-Khmer language. SIL survey work has identified two main dialects in Cambodia with a relatively high degree of mutual intelligibility. A high percentage of Kuy also speak Khmer. Living Situation: The Kuy are mostly poor rice farmers. They also gather forest products like honey, fruits and traditional medicines. Frequently, their diet consists of rice eaten with salt and chili peppers. 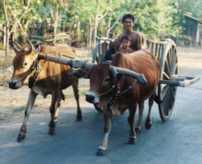 They live in villages, which are interspersed with Khmer villages. They often feel inferior to the dominant Khmer culture. Education: There is an extremely high rate of illiteracy. While the government has been building school buildings in their area, teachers are scarce. Schooling is in Khmer and lasts only two to three years. Religion: Animist/Buddhist. Animism is quite strong. They tend to be very superstitious. Christian Witness: Christian and Missionary Alliance started work with them in 1955 in Thailand and there are around 300 believers in several churches. Christian materials translated for this group are not very helpful in Cambodia as the dialects are too different. There is no known work among them in Laos. There may be about 50 believers in small groups in Cambodia. There is one missionary family with New Tribes now targeting the Kuy in Cambodia. They will move to a Kuy village to begin language learning this year. No scriptures are available but there is a Gospel Recordings tape available in Kuy for Cambodia. Please retain this information to help you pray for the Kuy people along with the prayer card enclosed. Thank you.